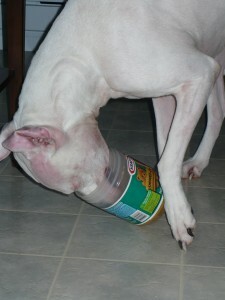 Corona Just Loves Peanut Butter! She just loves when we finish our jar of Kraft. Although Corona’s preference for Peanut Butter is simply to have it, at our household we can only have Kraft and when we finish a jar of it she’s delighted to lick the jar clean. We can only buy the big jars as we know the little ones just won’t offer our Dogo Argentino the adventure of sticking her entire muzzle to the bottom. With even the ever lasting smell of the snack in the jar it’s difficult for us to pry the empty, licked out jar from Corona’s nose. She even has her own jar for when she gets the delicious peanut butter in a kong but it’s funnier (and more tasty) to finish ours and pass it along. 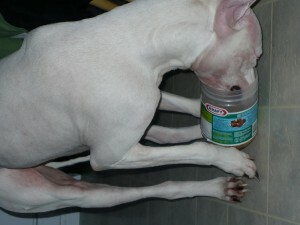 This entry was posted in Corona and tagged Corona, Dogo Argentino, Household, Kraft, Little Ones, Muzzle, Peanut Butter, Preference, Snack on April 8, 2009 by CoronaTheDogo.